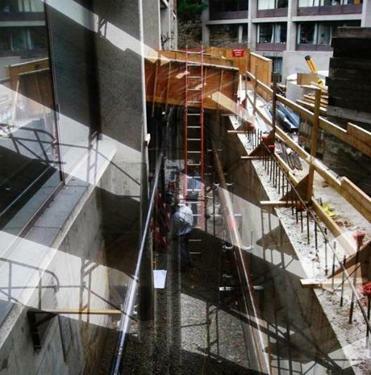 “Temporary Egress’’ is part of Daniel Feldman’s “Destruction/Construction” series, in a show of three photographers at BU. That famously thin line between love and hate? It’s nothing compared to the one between enchantment and creepiness. The depopulated city-scapes separately captured by Daniel Feldman, Stefanie Klavens, and Lynn Saville in “The Space in Between” suggest a no man’s land situated between magic and menace. The show runs through Jan. 19 at the Photographic Resource Center at Boston University. That no-man’s-land reference isn’t figurative. Only two men (and no women) can be seen in any of the 31 photographs in the show. They’re a couple of hard hats in one of the pictures from Feldman’s series “Destruction/Construction.” Even at that, you have to look close: They’re obscured by reflecting glass. As its title suggests, Feldman’s series shows demolition and building sites. There’s magnificence here, but it’s magnificence in considerable disarray. These are locations where things are going on — or have been — or are about to. They feel interrupted rather than evacuated, whereas evacuation is central to Saville’s images and Klavens’s. 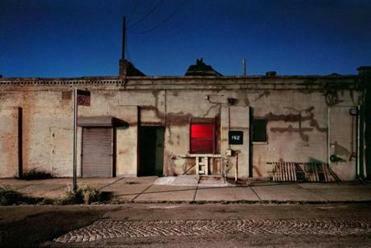 Saville’s “Storefronts in Flux,” which draws on her series “Night/Shift” and “Vacancy,” records the effects of the Great Recession on the urban landscape. The effects aren’t overt. There are no Occupy encampments or unemployment offices. Rather, it’s a sense of abandonment and indeterminate but unmistakable loss. Saville has long focused on “the boundary times between night and day,” as she puts it. And those “transitional times” serve to “underscore the shifting and uneasy nature of this era.” Does the indigo sky behind the battered building in “Dyckman St.” offer reproach, solace, or both? It certainly provides a chromatic foil to the defiant rectangle of red in the middle of the building facade. 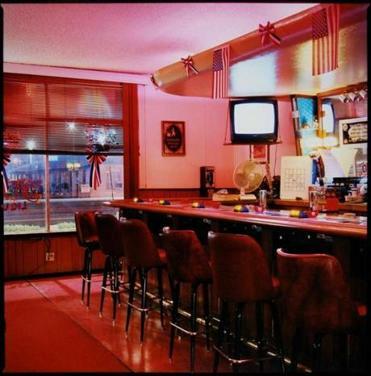 Stefanie Klavens’s “Reno Bar’’ is a lonely place. There’s an air of expectancy to the sites Klavens has photographed for her portion of the show, “Lonely Places.” Those places have clearly been lived in and used, yet now are empty — for the moment? For a while? For good? Part of the kick of these striking images with their very rich use of color is that nothing indicates an answer to those questions. As Klavens rightly notes, “one senses a human presence just out of reach” here. She photographs a derelict warehouse, a junk shop, a banquet room, a swimming pool at night by a busy street, a motel office, a bar in Reno (“I shot a bar in Reno just to” — oh, never mind). These aren’t necessarily places you’d want to visit. Looking at that motel office, you don’t find yourself wondering about check-in time. But they hold your attention. One reason is Klavens’s eye for detail. What’s most arresting about her pictures is the overall effect: the way atmosphere solidifies into subject. But very much enhancing that overall effect are the little things Klavens notices: the painting of the Last Supper leaning against a wall, in “Junk Shop”; the Vacancy sign outside the Diamond Crest motel office; the lozenge motif in the grillwork shuttering the Palace Theatre, in Los Angeles. People may not be visible. Their handiwork definitely is. Who knows, maybe they’re just out to lunch — but these photographs sure aren’t.